Enrollment in private colleges plummets as fewer families are willing to pay $200,000 for a second-tier school. From 2010 through 2012, freshman enrollment at more than a quarter of U.S. private four-year schools declined 10% or more, according to federal data The Wall Street Journal analyzed. From 2006 through 2009, fewer than one in five experienced a similar decline. Ivy League enrollments are flourishing, but less selective schools are suffering. The trajectory reflects demographic and technological changes, along with questions about a college degree’s value that are challenging centuries-old business models. The impact is uneven: Some wealthy, selective private colleges are flourishing, while many others suffer. Schools on the losing end are responding with closures, layoffs, cutbacks, mergers and new recruitment strategies. Many see these as the first signs of a shakeout that will reorder the industry. “I think it’s fair to say 30% of these private schools won’t exist in a decade,” said Jonathan Henry, vice president for enrollment at Husson University, a private school in Bangor, Maine, whose 2013 first-year enrollment was 17% lower than in 2009. “A lot of these schools will have to learn to live with less.” Husson has built graduate programs to offset the declines, he said. A toxic combination of trends is hitting hard. … long-term trends are buffeting these schools, including a national decline in the number of graduating high-school seniors, a swarm of technologies driving down costs and profit margins, rising student debt, a soft job market for college graduates and stagnant household incomes. Meanwhile, college costs have climbed at more than triple the inflation rate. Online alternatives are gaining ground. That stagnation coincides with new lower-cost online alternatives. The number of college students taking at least one online course nearly doubled to 45% between 2008 and 2013, according to a survey by Crux Research, a market-research firm. 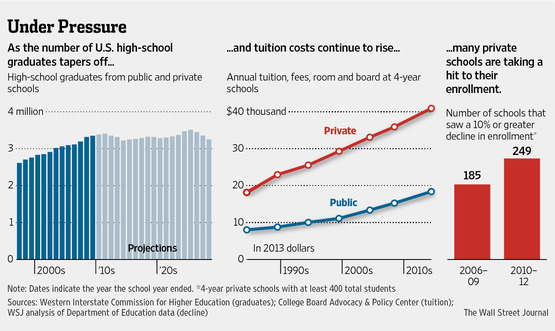 What will happen to second-tier private colleges that charge premium prices? They may become extinct. “The number of college students taking at least one online course nearly doubled to 45% between 2008 and 2013, ” Since currently, most students take their online courses from a traditional college or university, this statistic does not imply that colleges are going to fail. I teach them myself. Students will take an online course as well as regular courses in the same semester. I think that is pretty typical. Good point, but I’ve seen where the greater penetration of online courses into traditional schools makes parents and students wonder if the private school tuition is worth the money. Students largely hate the online courses. That is true. Perhaps that is one reason that the for profit online sector is struggling, much more so than the nonprofit traditional sector.